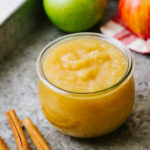 Healthy, homemade applesauce recipe made right in your Instant Pot (or slow cooker). Forget store bought, it’s so easy and incredibly delicious when made at home without sugar & additives, you’ll want to make it again and again! Unpeeled: Wash the apples well, quarter and core the apples, cut the quarters in half. Peeled: Peel the apples, quarter, core and cut the quarters in half. Place apples in the bottom of the Instant pot, add the lemon juice, water and optional cinnamon. Attach lid, and make sure vent is in the SEALED position. Push the PRESSURE COOKER button, and manually set the time for 6 minutes. When done, let the steam vent on it’s own, takes about 6 minutes. Move the vent to open, careful not to burn yourself as there may still be steam left. Remove lid and let cool a bit, remove cinnamon stick. Mash or puree: If cooking with the skins on, use an immersion blender right in the pot to puree the mixture, or transfer to a blender or food processor to puree until desired consistency. When cooking without the skins you can simply mash with a potato masher or back of a fork or slotted spoon. Add the apples to the bottom of the crockpot, add the lemon, water and optional cinnamon, and cover with lid. Set the slow cooker on high for 4 hours, stirring once or twice. Let cool a few minutes, remove cinnamon stick, and mash or puree. Store your applesauce in the refrigerator for up to 7 days, or freeze for up to 2 months. Makes 4 – 4 1/2 cups. For ultra smooth applesauce, use a blender to puree. If you prefer more sweetness, add a tad of sugar 1 – 2 teaspoons at a time until desired sweetness. If you didn’t add cinnamon while cooking, feel free to add some after cooking. When picking your apples stick with your favorites to start, using all of one type or a combination of 2 – 3 types of apples. Organic is best, especially if cooking with the skins on! I’ve used all fuji apples which were delicious and on the sweeter side. So if you prefer your applesauce to be very sweet use only fuji. As for combinations, my favorites are a mix of fuji and granny smith apples or a mix of honey crisp, granny smith and fuji. These combos balance each other out well, having just the right amount of natural sweetness and tartness. To peel or not to peel your apples? Peeling: It takes a bit longer to prep but the end result is a little easier since you’ll simply need to mash the apples with a potato masher, back of a fork or back of a slotted spoon. No Peel: The prep time moves along quicker, but the end time may take a little longer with the need to use an immersion blender, or transferring the cooked apples to a blender or food processor, to get a smooth consistency. The clear advantage of not peeling your apples is the health benefits, apples skins have antioxidants and fiber.